The Tennessee Titans’ new jerseys, as we saw when they were leaked on the internet earlier this week, are different … just not that much different. But when you combine the new jerseys with a bold new dark helmet? It’s a pretty sharp look. The Titans, who haven’t had a major uniform renovation since they changed from the Oilers to the Titans in 1999, refreshed their uniforms. They unveiled them during a big party in Nashville on Wednesday night that included a concert from Florida Georgia Line. And you have to start with the new helmet, which went from a fairly bland white to a pretty striking dark blue. While it’s not the most drastic uniform change, the new helmet look makes the kit as a whole look a lot different. The jerseys aren’t drastically different, but there are some changes. The numbers are a different style. The shoulders have a different color, and the Titans logo on the sleeve is gone. 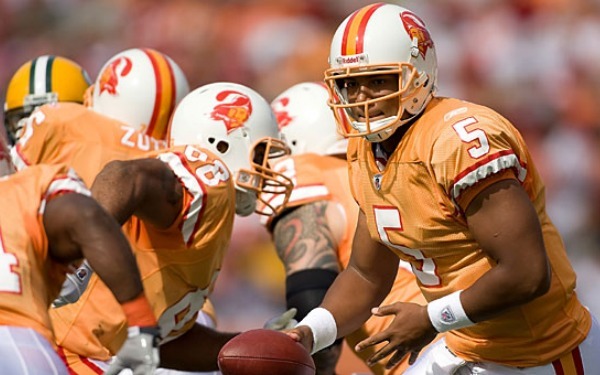 You’d probably notice a difference, but it’s not exactly like the Tampa Bay Buccaneers switching from the creamsicle orange uniforms to the pewter look. But the subtle uniform changes, along with a much different helmet makes for a much better look in Tennessee.